'Dodge City' (Larry Lauer, R. 1995). Seedling 89-29-1. TB, 38-40" (97-102 cm), Early bloom. Standards bronze tan overtoned melon; style arms bronze tan; falls bronze tan, slight blue violet flash around tangerine beard; slight sweet fragrance. 'Macho Hombre' X 'Role Model'. Stockton 1995. 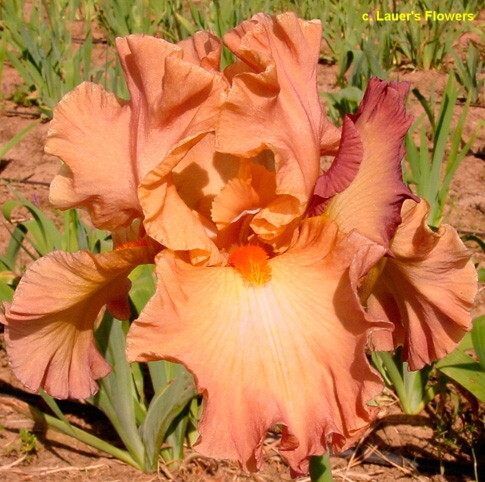 JPG DODGECITY1.JPG manage 167 K 23 Nov 2018 - 01:19 Main.TLaurin Photo by Debbie Carpenter-Iris Splendor Garden-Australia.